President Obama is easily one of the most emotionally connected Presidents this country has ever had. This is hugely due to his regular upbringing, and ...him being a Black Man in America. As President he often treads a slippery slope with his words and actions regarding the struggles faced by many people who look like him in the USA. Some feel like he should do/say more, others feel like it's not his place to get involved. Some people don't have a clue what his role is, and those people just have their emotions to go off of. Due to him being a Black Man in the White House, he must find balance between identifying with the reality of Black Men in this country, and what his job is. In a perfect world he wouldn't have such a battle, no President before him has had it. He is the first of our kind, and it seems to me that he's sort of feeling his way through it as anyone else would. I think it's a natural response to a role he can't call on Jay Z to write up a blueprint for. With that said, when he does get a moment to talk about this particular quandary I am always excited to hear what he has to say. At this year's Poverty Summit held at Georgetown University, participants got to hear him speak on a range of issues. My favorite part was him expressing how he sees his unique role. The President explained how being a Black Man affects the way he addresses certain situations..zeroing in on my Brothers of Morehouse College as a reference. Shout out to that! He spoke about what he represents to many young Black Men, the issues stemming from growing up without a father, and much more. While he will never satisfy everybody I'm encouraged to hear him address something like this on such a platform, because it's real. His life experiences as a child and teen mirror that of many of the young men whose lives so carelessly hang in the balance here in these United States of America. 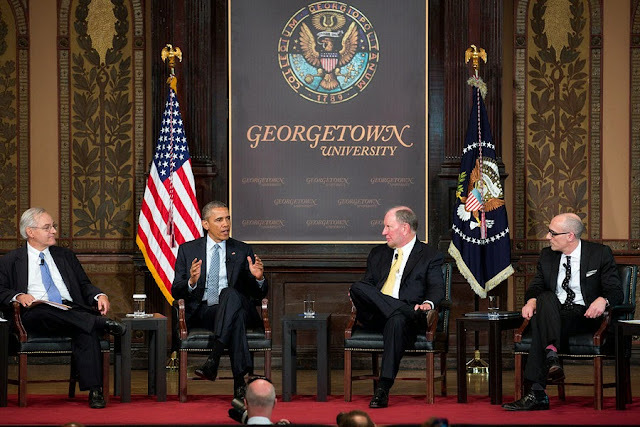 During this visit to Georgetown, he was careful in making it very clear that he has a responsibility to identify with the reality of his own existence, even if it's not a very popular political discussion.